Since the start of the #MeToo movement, organizations have been taking a fresh look at their anti-sexual harassment policies and training in the workplace. For training in particular, the challenge is no less formidable today than it was in 2016 when the US Equal Employment Opportunity Commission released an extensive study on general harassment in the workplace—especially considering the commission itself has questioned whether training generally works (and suggested it may even do more harm than good). With limited data available on what works and what doesn’t, it’s difficult for anyone to know which training methods to recommend or embrace. As someone who’s worked closely with HR and legal for 20 years in order to design eLearning technology that supports their eLearning teams, I’ve come to believe that there is only one truth when it comes to training: there is no single truth. What works for one trainer and one learner may not work for another—and for so many reasons. There are some common missteps that almost always result in failure. The biggest problem, in my experience, is trainers design programs that prioritize the requirements of the regulators over driving behavioral change. Unfortunately, what people realistically need from training in order to adopt a more intolerant mindset when it comes to sexual harassment goes far beyond what must be presented to assure regulatory compliance. As the EEOC itself wrote, “Much of the training done over the last 30 years has not worked as a prevention tool—it’s been too focused on simply avoiding legal liability.” Training commonly shortchanges workers in other ways, too. Sometimes fault lies with general training flaws that would sink any session regardless of topic. Engagement, for instance, continues to be a critical yet elusive pursuit for many trainers. But boosting engagement in anti-sexual harassment is particularly tricky as it requires an ability to “go there” without triggering discomfort or ridicule or, even worse, causing learners to feel like they’re being subjected to sexual harassment within the anti-harassment training itself. One thing the EEOC and many other experts agree on: these training sessions are most effective live and in person. However, for many organizations that depend on remote, dispersed workforces, it’s a luxury they simply can’t afford. So, they turn to virtual live training, which can be extremely effective regardless of the subject matter, but they also require a unique set of parameters for success. Another challenge, particularly with on-demand, or poorly designed live virtual training, is the student’s tendency to multitask. Often they will turn the volume down, check voice and email, glancing at the presentation (pushed to the side of the screen) from time to time while working on other projects. Overcoming this tendency not only requires post-training testing to ensure the information was absorbed, but a live virtual training approach that demands high interactivity to ensure the audience is engaged and the information is absorbed. When designed and executed well, the material and the experience permeates minds and, ultimately, the organization’s workforce culture. So how does a trainer prioritize personal need over regulatory need? How does one wade through sensitive waters in a way that’s not counter-productive? How can you compete with a workforce culture that might think the “harassment police” are going too far by trying to stifle even the smallest hint of sexual nuance in the workplace? The EOCC does suggest dividing your training into three categories—1. compliance and reporting (“these are the rules—obey them or lose your job”), 2. civility (“just be more considerate and sensitive to your colleagues in general, and you’ll be fine”), and 3. bystander intervention (“how to spot, prevent and report infractions”). While the EOCC—and to be fair, just about all of us—fall short in being able to provide universally foolproof anti-harassment training, I think this provides an excellent guideline. But the list only addresses the what in what needs to be conveyed. What about the how it needs to be conveyed? The answer, again, is there is no single catch-all. But, therein lies the insight. One absolutely essential step that all organizations should take (but most skip) is doing a little homework to gauge the worker attitudes and opinions they’ll be dealing with in these sessions. You can’t help someone find their destination if you don’t know their starting point. You must know your audience before you can even think about designing your session. The EOCC suggests conducting ‘climate surveys’ that help gauge the level of harassment that occurs in the workplace. These can also be used to determine the confidence level employees have in the organization to protect their privacy and job if they come forward with a complaint. Has #MeToo inflamed some cynicism or resentment in the ranks? Are some workers still trying to hold on to the “good old days”? These are the kinds of things you’ll want to know about your learners before you start working on what needs to be conveyed. Equally critical, as the EOCC also suggests, is identifying the inherent risk factors within your organization that may be contributing to a workforce culture that enables sexual harassment to occur. Do your workers tend to socialize in bars after work? Are there cliques? Is your workforce predominantly male? Do you have high value workers to whom not all the rules apply—a highly successful salesperson, for instance, who generates a lot of revenue but also resists the bounds of appropriate office etiquette? Not only do you need to determine how to incorporate these risk factors into your training, you also need to look at whether to segment and micro-train your workers. You’ll want to target, for instance, your C-level suite with training sessions that address workplace policies, values and overall workforce culture that must be instated at the top and regularly evangelized. Here, you’re communicating to those in positions of power not only what is and isn’t appropriate, but that reports of harassment will be taken seriously and processed strictly by the book—that the company will abide by a rule of law that binds all workers regardless of rank. Another way to apply the power of people is to invite external attendees. These can be workers from another department or even a different company. They can form a panel of experts or, if you have a high men-to-women ratio for instance, you could bring in additional women to help the minority feel more comfortable in speaking up. Questions could be submitted anonymously yet addressed by the panel in front of the entire group, creating a safe space for difficult conversations. There is nothing wrong with tapping into the power of peer guidance to demonstrate there is support within the ranks for a safer work environment and that crossing certain lines will be viewed not just by the company but by its people as harassment and not tolerated. In fact, involving workers in the discussion serves a number of purposes. It gives teeth to the tenets of bystander intervention signaling that the office is now a neighborhood watch in which infractions will likely be seen and reported. This in turn helps address (though not completely resolve) an issue many people have when encountering sexual harassment—namely, the fear of coming forward. Despite what an organization communicates to its workers, after decades of sexism, harassment and “looking the other way” in the workplace, people have learned that often it’s the reporters not the offenders who are consequently ostracized, penalized, or outright dismissed and burdened with damaged reputations that can prevent them from getting hired elsewhere. Back and forth discussion with learners also helps trainers identify and address grey areas that might not have been anticipated while at the same time avoiding the cardinal sin of presenting outdated harassment scenarios that reveal complete ignorance of all the complexities of sexual harassment on the part of the presenter. There is a good chance that workers can help illustrate a number of new situations that blur the boundaries established by policy simply because they’ve already experienced them. Engaging workers in interactive discussion also creates an opportunity for intake that provides more informed and custom policymaking. Trainers can better understand where workers are coming and refine their training methods accordingly. Presenters, then, must be able to understand and fully embrace a more multi-faceted role. They are not merely there to broadcast information. They are there to inform, guide, moderate, listen, and adjust. Yes, they too, must learn. Of course, a few tips and guidelines won’t be enough to create an effective anti-sexual harassment training program. There is no one manual that can serve all needs. But we should all continue adding to the ongoing national discussion with the ideas, lessons and frustrations that over time can help every organization create and customize their anti-sexual harassment training programs for lasting impact as well as take harder looks at not only how worker attitudes must change, but how the organization itself must change. 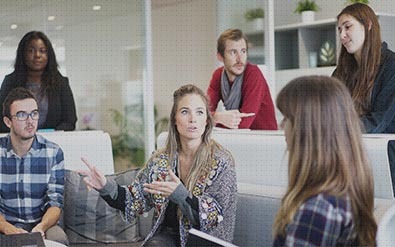 As the EOCC wrote, “Training cannot stand alone but rather must be part of a holistic effort undertaken by the employer to prevent harassment that includes the elements of leadership and accountability.” Trainers themselves must be allowed to evolve their mission from merely communicating corporate policy to helping shape it. All of us in fact, must add Harassment Response to our job descriptions in order to make the workplace safer. Trainers, it’s up to you to show us how to do that.